A lovely photo from last weekend of our two UK judges with our Head Steward! 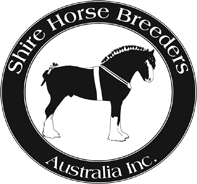 Shire Horse Breeders Australia Inc updated their cover photo. Grand Champion Led Horse from the 2019 National Shire & Southern Highlands Heavy Horse Show. Shire Horse Breeders Australia Inc shared a photo. Our two top awards in the working ring this weekend were Champion Working Horse & Best Horseman/Horsewoman. Pictured - Judge Matthew Thompson, Champion Working Horse Grace & her driver Aleks Berzins with SHBA President Cai Thomas. Our four Supreme Breed Champions from the National Shire & Southern Highlands Heavy Horse Show 2019 - what a stunning bunch! What a massive weekend!! Now that I’m home and have had a decent nights sleep, I’d like to take the opportunity to say a huge thank you to everyone involved in making the 2019 National Shire & Southern Highlands Heavy Horse Show such a massive success. To our exhibitors - thank you for coming along and supporting our newly expanded show. It was truly wonderful to see so many horses out in the rings competing! We had a lot of positive feedback and I’m so glad you all enjoyed it! To our sponsors - thank you very much for making it possible for us to run such a successful show. We couldn’t do it without you. To our judges, stewards and announcer - your hard work in keeping the show running smoothly is appreciated more than I can say. To my committee and their family members - thank you for your tireless work in helping me take this show from concept to live event. It was better than I’d dared hope and I could not have done it without all of your help. Finally, I’ll add I’m so glad you all braved the inclement weather. Fingers crossed Mother Nature is a bit kinder to us next year!